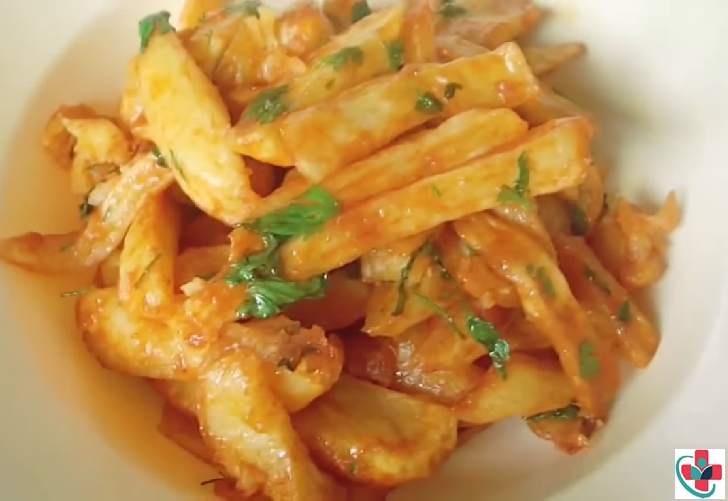 Ever since I started making masala chips, I was sold out to this brilliant art of transforming ordinary looking fries into something so yummy! It’s another way of feeling as though you have eaten the healthier version of deep-fried fries, yeh! but we all have lies we tell ourselves. So today I share with you the procedure or ‘the recipe’, as per my kitchen adventures. Crispy on the outside, fluffy in the centre and delicious through and through. Add the chili powder and salt into the garlic mix to make a paste. If you like your food spicy, go heavy on the garlic and chili powder. Add oil or butter in a pan and fry the onions till they are softened and very slightly browned. Add the tomatoes and turn to medium heat; stir constantly for about 10 minutes or until the tomatoes are cooked forming a thick paste. Add the tomato ketchup and stir. Add the fries, turn the heat down and mix thoroughly but not so much until the fries start breaking apart. Add as much coriander as you wish and garnish with lemon juice. Leave for about 10 minutes and you are good to go! If you are not too keen on spice you can add 1 tbsp of vinegar to get it very tangy.